Our Heart Photo Rainbow Bridge Wooden Pet Urns are made of solid Red Alder and Red Oak from the USA. Red Alder is a smooth surfaced wood that makes for a beautiful background for the Rainbow Bridge Poem along with the name and dates of your cherished and beloved pet. 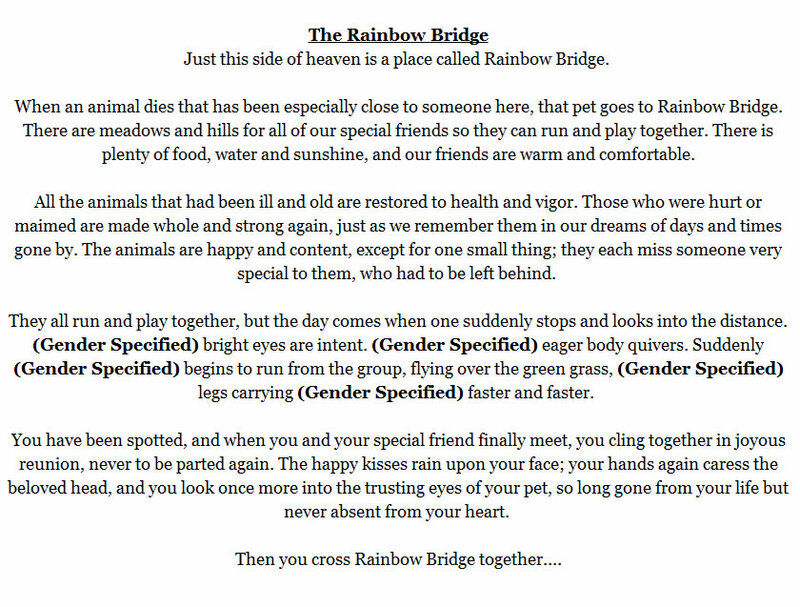 Click on Detailed Images to read the Rainbow Bridge Poem. The engraving and workmanship of this urn is absolutely professional in quality. A cherished picture of your pet can be added to the heart-shaped photo frame. The above photo shows the Medium Size urn. This is a quality product created by skilled craftsmen in the USA. Please allow 3-5 business days after engraving proof has been approved to complete. Rush orders are also a possibility but still require at least 2-3 business days to complete. *Note: Industry standard for pet urn sizing is 1 pound of healthy body weight = 1.25 - 1.5 cubic inches of cremains (approx: can vary by 30%) Example: A pet with a healthy body weight of 50 lbs could have 62 - 75 cubic inches of cremains, possibly more depending on their bone density and the cremation process used.